Leading law firm Madden and Finucane said in a statement yesterday it wanted to “make representations” to prosecutors following the publication of the Seville report on Tuesday. However, it was unclear when the lawyers will meet the PPS with the firm only saying it will be making “representations in due course”. The Saville report found that none of the dead had been armed when they were shot in Derry on January 30 1972 and that soldiers from the Parachute Regiment had deliberately fired into crowds of civil rights marchers without warning. Madden and Finucane represents the families of 10 of the victims, including Jackie Duddy, Michael Kelly and Willie McKinney, as well as nine people who were injured on Bloody Sunday. Michael Kelly’s brother John has already said he hoped the soldiers involved would be prosecuted. The PPS has aid it will look at the possibility of prosecutions and is investigation, along with the Crown Prosecution Service, whether witnesses at the Saville inquiry had committed perjury. Solicitor Peter Madden said the firm and the families are reading the Saville report carefully and will look at the “legal options available to them”. “This will take weeks,” he said. He said the families will attempt to “approach the legal options as a unified group, supporting each other in thoughtful debate”. Mr Madden also paid tribute to the families’ 38-year search for justice. “These families, and families like them, are the true human rights defenders and those suffering injustice anywhere should look to them for inspiration,” he said. Meanwhile, the man singled out for blame over the death of 14 people on Bloody Sunday has again refused to apologise for his actions after he was tracked down by a Sunday newspaper. Lieutenant Colonel Derek Wilford approached by The Irish Mail on Sunday at his home in a tiny Belgian village. The paper said Wilford has been living in the village with his wife Linda for the past three decades and he teaches fine art nearby. Last week’s Saville report said Wilford ignored orders from his army superiors not to pursue suspected rioters through the Bogside. When confronted by a reporter, Wilford refused to comment on his role on Bloody Sunday. Asked if he had anything to say to the families of those killed on Bloody Sunday, Wilford replied: “It’s all been said. I don’t want to talk about it. Republican Sinn Fein President Des Dalton said the Saville Inquiry had failed on the crucial question of the responsibility for the murders. “The ‘Saville Inquiry’ lays sole responsibility for the murders on the British soldiers who fired the shots on ‘Bloody Sunday’ and their commanding officer [Wilford]. Mr Dalton said three times in the 20th Century the forces of British occupation had visited a ‘Bloody Sunday’ on the Irish people. “While British rule remains in Ireland the possibility of yet another will always exist. “The British Government’s apology for the murders of ‘Bloody Sunday’ is meaningless while it continues to occupy Ireland. * A Bloody Sunday memorial in Derry has been vandalised. The top of the sculpture at the Gasyard in the Bogside was knocked off over the weekend. 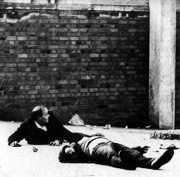 Last week, the Bloody Sunday Inquiry under Mark Saville published a report which found the 14 people shot dead by Paratroopers in 1972 innocent. Brian McGee, who helped create the art work, said it was a mystery why it was vandalised.